Volunteer in Mozambique on the Marine Research and Whale Shark Conservation Project and help with hands-on whale shark research, coral reef monitoring, humpbacked whale monitoring and turtle nest surveys. Explore one of Africa’s best scuba diving destinations with a PADI or SSI Dive Course, which is included in the project (project to decide on the course). The Marine Research and Whale Shark Conservation Project involves gathering field data on whale sharks, coral reefs, manta rays and other marine biodiversity to make recommendations for improving the conservation of marine life as well as creating general awareness about the marine environment. In recent months, the number of whale shark sightings has dropped and it is essential that the monitoring and conservation of marine habitats and wildlife continue to try to establish the cause of this change in behaviour. The project collaborates with a number of international marine research bodies including the Ecocean global whale shark database. Learn about whale sharks, the oceans biggest fish, swim next to these harmless species, observe the population dynamics and learn about its threats. Discover marine life and the threat that the coral reef is under threat due to exploitation, bleaching, alien invasive species and other ecological changes associated with tourism and other human activities. Monitor the condition of coral reefs in the Tofo area using methods based on the international reef check program. This involves doing scuba diving transects along the reefs and recording coral cover and indicator species of fish in one of Africa’s best diving destinations. As a volunteer, you will help carry out the marine research and monitoring activities for the project under the guidance of our project co-ordinating project scientists. You will join other volunteers on the project to collect the data via beach walks, boat surveys, swims and scuba dives off the coastline of Tofo in Mozambique. For those of you who volunteer for 4 weeks or longer, you will have the opportunity to participate in a seahorse and biodiversity monitoring trip. You can expect an excellent diving, snorkelling and beach experience whilst gaining first-hand marine research skills and contributing to a worthwhile project. In order to carry out these activities you will need to be a capable swimmer (swim 100m unassisted), snorkel and it would be advantageous if you are able to hold your breath to dive down. In order to carry out these activities, you will need to be capable of equalising your ear pressure and willing to learn to scuba dive. A four-day internationally recognized open water diving course (PADI or SSI) is provided as part of this project to train you to be able to carry out this coral reef monitoring. If you already have this qualification you may do an advanced open water diving course instead or an equivalent number of extra research dives. Beginner divers need to volunteer for a minimum of 3 weeks to maximise their time spent on conservation volunteer activities. Mozambique has most recently become famous for its magnificent coastal waters. These crystal blue waters are teamed with a rich array of wildlife – including whales, dolphins, dugongs, manta rays and schools of tropical fish – which are starting to attract the world’s diving communities. Did you know that the narrowest point of the channel of water between Mozambique and the island of Madagascar is just under 500km? That’s around 300 miles, so there is plenty of room to discover marine wildlife. During your time on the project, you will be located in Tofo, a small beach town that is located on the eastern shores of Inhambane Peninsula. The house is a 2-minute walk from Tofinho beach and about 800m from Tofo Beach. Tofo village centre is also within easy walking distance, where there are very basic shops, a few restaurants and bars and a number of beach activities available. Set amongst palm trees, the accommodation is a traditional reed house situated just back from the dunes of Tofinho beach. The house has electricity and running water, with an open kitchen and living area and ample room to relax outside. Excursions are optional and during weekends you will be free to travel and explore as you choose. 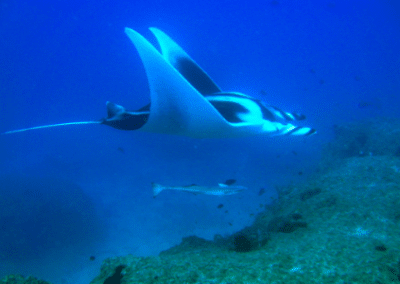 In Tofo, snorkelling and scuba diving are very popular activities, as there is an array of marine life to see, such as whale sharks, giant manta rays and turtles. Additionally, you can sail via Dhow safari to the Bazaruto Islands, or go deep-sea fishing on the beautiful waters. Be sure to visit the beachfront and sample some of the local food from the seafood restaurants for an incredible meal! If you want to venture further afield then a long weekend may be arranged, where possible, and expeditions to Kruger National Park and Swaziland may be available too. Project activities: whale shark and manta ray research, data collection, underwater photography, GPS positioning, coral reef monitoring; internationally recognised qualification for beginners or open water divers. Internationally recognised scuba diving open water course and qualification; other courses offered for qualified divers. Activities: staff help organise weekend activities (activity price may be extra). Trips include: snorkeling, safaris or horseback riding on the beach. Additional dive training, including a scuba assessment for qualified divers who haven’t dived in the last 6 months.